The idea is astonishing in its audacity: a film of two friends talking, just simply talking—but with passion, wit, scandal, whimsy, vision, hope, and despair—for 110 minutes. It sounds at first like one of those underground films of the 1960s, in which great length and minimal content somehow interacted in the dope-addled brains of the audience to provide the impression of deep if somehow elusive profundity. 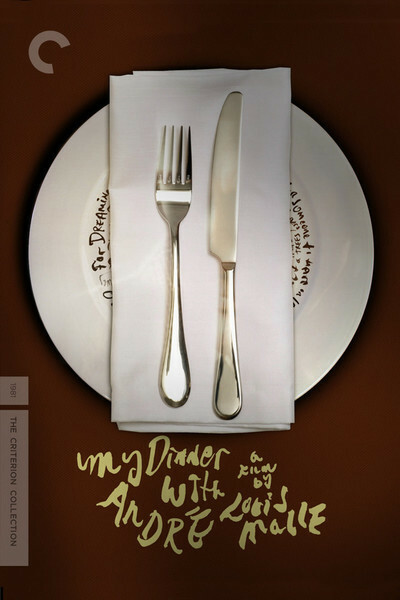 "My Dinner with Andre" is not like that. It doesn't use all of those words as a stunt. They are alive on the screen, breathing, pulsing, reminding us of endless, impassioned conversations we've had with those few friends worth talking with for hours and hours. Underneath all the other fascinating things in this film beats the tide of friendship, of two people with a genuine interest in one another. The two people are André Gregory and Wallace Shawn. Those are their real names, and also their names in the movie. I suppose they are playing themselves. As the film opens, Shawn travels across New York City to meet Gregory for dinner, and his thoughts provide us with background: His friend Gregory is a New York theater director, well-known into the 1970s, who dropped out for five years and traveled around the world. Now Gregory has returned, with wondrous tales of strange experiences. Shawn has spent the same years in New York, finding uncertain success as an author and playwright. They sit down for dinner in an elegant restaurant. We do not see the other customers. The bartender is a wraith in the background, the waiter is the sort of presence they were waiting for in "Waiting for Godot." The friends order dinner, and then, as it is served and they eat and drink, they talk. What conversation! Gregory does most of the talking, and he is a spellbinding conversationalist, able to weave mental images not only out of his experiences, but also out of his ideas. He explains that he had become dissatisfied with life, restless, filled with anomie and discontent. He accepted an invitation to join an experimental theater group in Poland. It was very experimental, tending toward rituals in the woods under the full moon. From Poland, he traveled around the world, meeting a series of people who were seriously and creatively exploring the ways in which they could experience the material world. They (and Gregory) literally believed in mind over matter, and as Gregory describes a monk who was able to stand his entire body weight on his fingertips, we visualize that man and in some strange way (so hypnotic is the tale) we share the experience. One of the gifts of "My Dinner with Andre" is that we share so many of the experiences. Although most of the movie literally consists of two men talking, here's a strange thing: We do not spend the movie just passively listening to them talk. At first, director Louis Malle's sedate series of images (close-ups, two-shots, reaction shots) calls attention to itself, but as Gregory continues to talk, the very simplicity of the visual style renders it invisible. And like the listeners at the feet of a master storyteller, we find ourselves visualizing what Gregory describes, until this film is as filled with visual images as a radio play—more filled, perhaps, than a conventional feature film. What Gregory and Shawn talk about is, quite simply, many of the things on our minds these days. We've passed through Tom Wolfe's Me Decade and find ourselves in a decade during which there will apparently be less for everybody. The two friends talk about inner journeys—not in the mystical, vague terms of magazines you don't want to be seen reading on the bus, but in terms of trying to live better lives, of learning to listen to what others are really saying, of breaking the shackles of conventional ideas about our bodies and allowing them to more fully sense the outer world. The movie is not ponderous, annoyingly profound, or abstract. It is about living, and Gregory seems to have lived fully in his five years of dropping out. Shawn is the character who seems more like us. He listens, he nods eagerly, he is willing to learn, but—something holds him back. Pragmatic questions keep asking themselves. He can't buy Gregory's vision, not all the way. He'd like to, but this is a real world we have to live in, after all, and if we all danced with the druids in the forests of Poland, what would happen to the market for fortune cookies? The film's end is beautiful and inexplicably moving. Shawn returns home by taxi through the midnight streets of New York. Having spent hours with Gregory on a wild conversational flight, he is now reminded of scenes from his childhood. In that store, his father bought him shoes. In that one, he bought ice cream with a girl friend. The utter simplicity of his memories acts to dramatize the fragility and great preciousness of life. He has learned his friend's lesson.